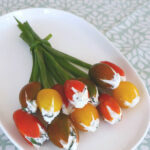 These cherry tomato flowers are such a pretty way to decorate your spring or Easter table. 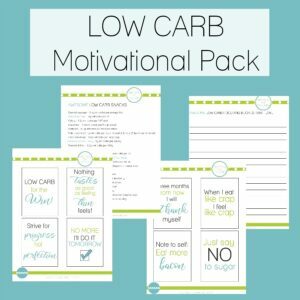 And they’re naturally low carb and keto-friendly, too! 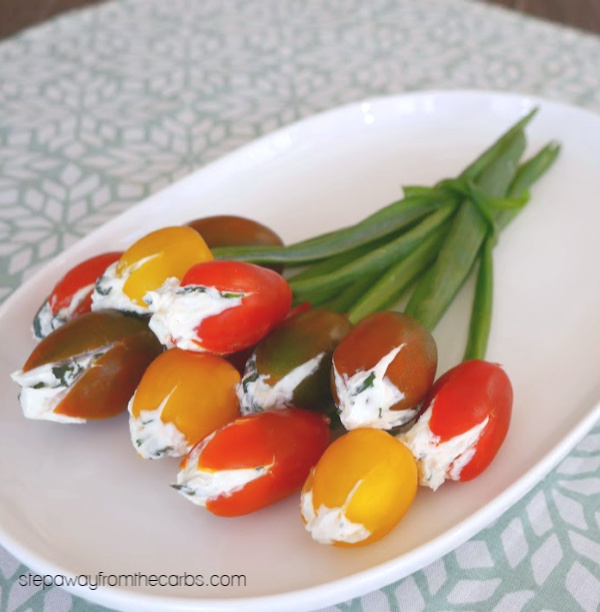 This recipe was inspired by the Cherry Tomato Tulips from The Thrifty Couple. It was one of those “see it on Pinterest and just HAVE to try it” moments! 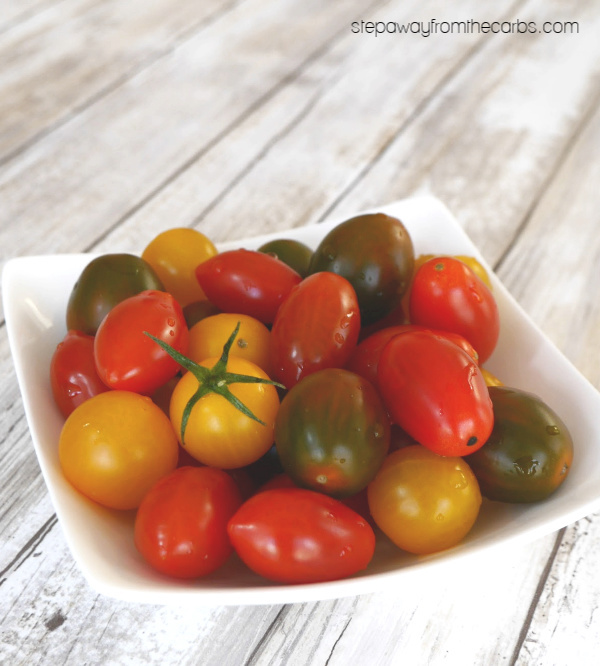 In my version I’ve slightly adapted the filling plus used a variety of cherry tomatoes for a pleasing “bouquet”. 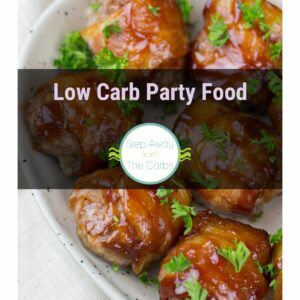 And I’m going to be honest – this recipe probably gets the award for the trickiest dish on the whole blog! But it’s probably one of the prettiest, too. My husband walked in while I was making them and was really impressed. 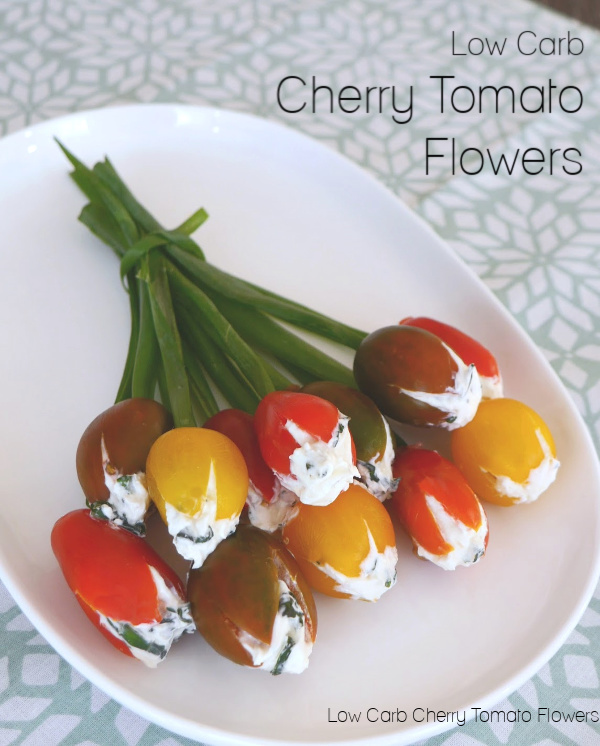 These cherry tomato flowers would be ideal for a centerpiece at any Easter or spring party. As well as looking beautiful, the stuffed tomatoes are really delicious, too! So find yourself a spare half hour, relax, and make something pretty to eat! Mix together some softened cream cheese, finely chopped fresh basil leaves and black pepper in a small bowl, then set aside. Cut a cross-section at the end of each of the tomatoes using a sharp knife. Make a hole in the opposite end for the “stem”. Carefully spoon the cream cheese mixture into each flower. This can get a little messy, so have some paper towels on hand for cleaning up yourself AND the tomatoes after they have been stuffed. 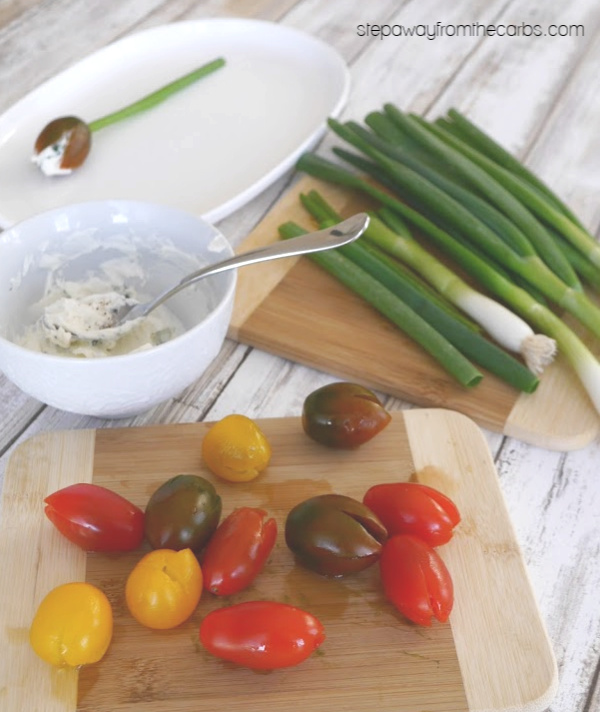 To finish, slice the green parts of some green onions lengthways (you could also use fresh chives if they are sturdy enough), and poke them into the hole at the base of each tomato. Carefully lay them on a plate, and use one final piece of green onion to tie a knot around the stems. Your guests will really appreciate your efforts! These cherry tomato flowers are such a pretty way to decorate your spring or Easter table. 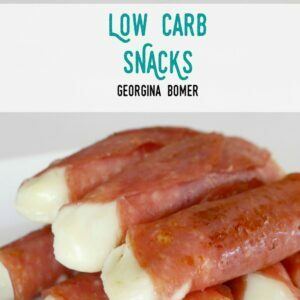 And they're naturally low carb and keto-friendly, too! Mix together the softened cream cheese, chopped basil and black pepper in a small bowl, then set aside. 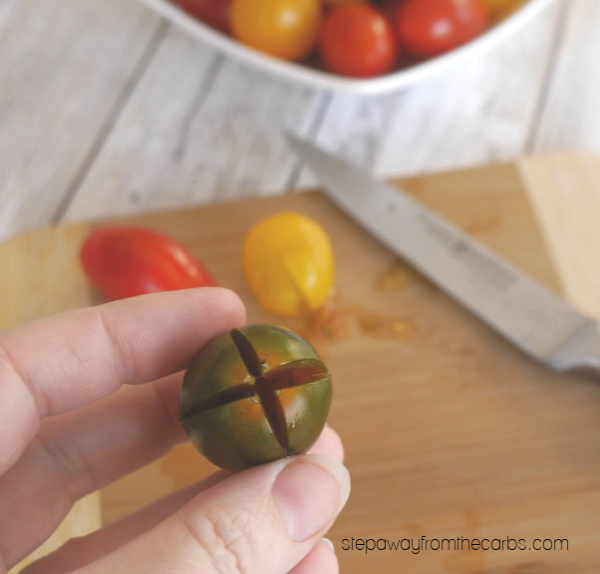 Cut a cross-section at the end of each of the tomatoes using a sharp knife. Make a hole in the opposite end for the "stem". Carefully spoon the cream cheese mixture into each flower. This can get a little messy, so have some paper towels on hand for cleaning up. To finish, slice the green "leaves" (or tops) of the green onions lengthways, and poke them into the hole at the base of each tomato. Carefully lay them on a plate, and use one final piece of green onion leaf to tie a knot around the stems. 2g net carbs per serving of three cherry tomato flowers. What an artistic food idea! !Have the occasion already planned!! Many thanks!